Alumna Jenny Border ’11 tries out the Obi with inventor Jon Dekar, president and co-founder of DESiN, LLC, and Anthony Grigsby from Wright State Hospitality Services. 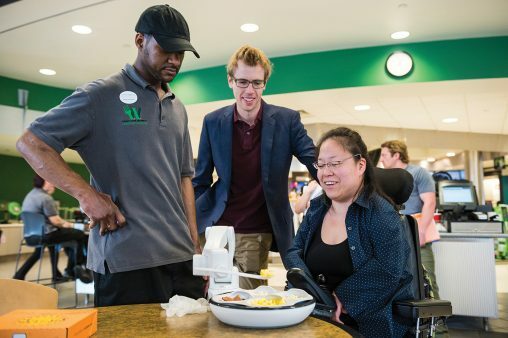 A grant from the Christopher and Dana Reeve Foundation could revolutionize how Wright State University students with disabilities eat their meals. Thanks to the $15,000 Direct Effect Quality of Life grant from the Reeve Foundation, Wright State’s Office of Disability Services was able to purchase three robotic dining devices for students who need assistance feeding themselves. Obi — invented by Jon Dekar, president and co-founder of Dayton-based DESiN, LLC — enables diners to have a more empowering and independent experience by giving them control over selecting food items and using a spoon to guide food to their mouths. The robot can be programmed for 6,000 different feeding positions within one millimeter of accuracy. Dekar came up with the concept of Obi after watching his grandmother spoon-feed his grandfather, who suffered from a degenerative neuromuscular disease. Wright State alumna Jenny Border ’11 has used Obi to eat numerous times. She said the device has transformed the dining experience for her, enabling her to better engage socially with her dining companions and attend important professional networking events that involve meals. Border knows from firsthand experience how Obi could be a great dining feature for Wright State students with disabilities. When she was a first-year student at Wright State, Border would often skip meals in the cafeteria because it was socially awkward for her. Her disability required that someone feed her or that she eat her food directly with her mouth. “Students with disabilities just want to feel connected and be a part of the community,” Border explained. The Obi devices will be incorporated into the two campus dining locations where many of Wright State’s students with disabilities eat on a daily basis. Those 15 to 20 students with multiple disabilities currently receive personal assistance from a pool of caregivers who assist and help feed them. Jim Hannah contributed to this article.